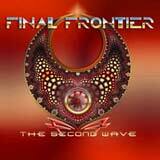 Final Frontier is the brainchild of Von Groove's Mladen Haze and vocalist Bob Moratti. After their latest album, Freelight generated some buzz amongst AOR and hard rock fans earlier this year, I thought I'd take the opportunity to shine the light on perhaps their greatest effort to date, The Second Wave. The sound of Final Frontier is firmly based in the big, stadium friendly AOR and hard rock anthems that dominated the 80's music scene. The band makes no attempt to modernize their sound, or try and be something they are not. High pitched vocals (which admittedly, may not appeal to some), over the top melodies, keyboards, and lush production are what fans of this band have come to expect. Clearly, the audience of Final Frontier will be those who enjoy 80's style melodic hard rock. If anything, Final Frontier can be classified as a very consistent band. The Second Wave remains my personal favorite of the band, but not by a wide margin at all. It's a shame that these guys haven't had more exposure than they have. Depending on my mood, the other three albums would vary in rank from second to fourth on any given day. For anyone who gives one album a chance and likes it, you can virtually be assured that you will enjoy all the band's work. The Second Wave is an album that passes from start to finish before you even know it. Each of the songs is a true killer, leaving its long lasting mark on the listener along the way. Beyond that, the lyrics are of the feel good variety, typically dealing with the positive aspects of relationships. Having said that, I guess that if you've just been dumped by a long time significant other, this probably isn't the best CD for you to pull out! However, Final Frontier albums are normally the type that allows you to forget your problems for 45 minutes or so, and just put you in a good mood while you're listening. As for the songs themselves, this album delivers a nice balance of hard rocking anthems, mid paced tracks, and a couple well written ballads. All in all, The Second Wave has all the ingredients that made albums such as this a big hit some 20-25 years ago. The voice of Rob Moratti provides the distinctive character for the band. He sings purely in the high registers, similar to maybe Chicago, but these guys actually rock, unlike the purely balladesque (cough....punchless...cough) Chicago. Furthermore, Moratti is simply a natural in this range. He certainly doesn't strain himself to reach and sustain these higher notes. Instead, it's very much the contrary. Moratti's voice soars throughout the album with such ease and emotion. With the music at hand, I couldn't envision a different vocal approach. The formula here works like clockwork. The lush harmony vocals that accompany Moratti's voice, especially during the chorus lines help to provide depth to the sound and to greatly enhance the melodic quality of the music. Keyboards have a sensible and tasteful presence in the band's sound. They are used throughout most of the album to enhance the melodies and complement the arrangements, but never become overbearing as to regulate the guitars to the background. From the opening riff of the title track, you know that catchy riffs are going to carry the songs, with polished solos adding plenty of flair. Mladen Haze handles all guitar, bass, and keyboard duties for the band. Various guest / session musicians are credited on all Final Frontier albums, but it is clear that Haze has a vision for the music. I assume that the only way that Haze can translate his vision into actual sound is for him to perform each component of the sound himself. Of course, that reminds me of a similar situation with Boston. Tom Scholz performed nearly all aspects of the band's classic albums. I can't say that the two men's motivations are definitely the same, but I get that vibe from the music. Final Frontier's music flows naturally from one song to the next, with a chemistry that just clicks everyone second of the album. The majority of the album consists of up tempo AOR meets melodic hard rock, but none of the songs ever sound the same. You have outright rockers such as the title track, Runaway, Lost Inside a Dream, and Faithful Heart. On the other hand, you have more poppy, AOR style anthems such as When it comes to ballads, Cinderella in Rags and After the Fall would give any number of power ballads from the 80's a good run for their money. The band doesn't go overboard with the ballads however, as these 2 are the only true ballads of the album. One thing that irks me about some albums of this genre is a band's tendency to include too many ballads, which drag down the pace of the album. Two is perfect for this album as it provides balance without killing the flow of the album. I have to say that Final Frontier nail the slow songs just as well as they nail the rockers. This is again testament to the high quality and thoughtfulness that is so evident in this band's songwriting. For any fans of this style of music who may have just discovered this band with their latest release Freelight, go ahead and check out this release next and I guarantee you will be hooked on this underrated band. With four albums now under their belt, I am convinced that Final Frontier are poised to become a powerhouse in this genre. If you like AOR meets melodic hard rock purely grounded in the 1980's way of things, you can't miss this band. You really can't go wrong with any of the band's albums. The Second Wave may be the most consistently rocking album of the four, but the songwriting is stellar on each release. This is a good album to introduce yourself to the band with if you have not already done so. If you dig The Second Wave, the others are a blind buy.